It's a production without flaw. Photo courtesy of Rockhan Photography. 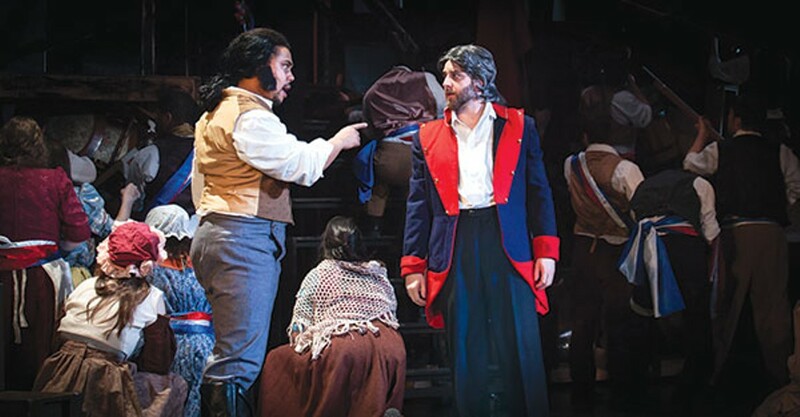 Peter Matthew Smith (left) and Brady Patsy in Pittsburgh Musical Theater's Les Misérables. continues through Sun., April 6. I heard them loud and clear hours after the Pittsburgh Musical Theater/Robert Morris University production of Les Misérables had ended. Angry? I was basking in delight, especially since I was afraid that this was going to be as bad as the mess recently staged at the Benedum. Jean Valjean is sentenced to prison for 19 years for stealing a loaf of bread. He's caught, but through the kindness of a bishop from whom he was stealing, Valjean reinvents himself as a successful businessman and mayor. For every step Valjean takes, one is taken by Javert, the police inspector who haunts his life, bent on hunting him down. 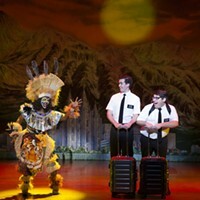 Perhaps this is the first production I have seen directed by PMT's Ken Gargaro, and it is without flaw, streamlined but seamless as just about any show (yes, professional) that I have seen since 1969. Boublil and Schönberg's cautionary tale of theocracy is populated by whores, illegitimate children, oppressed masses, overweight innkeepers, drunks, pimps and crowds of shady characters and dirty denizens who take to the sewers of Paris faster than any phantom could. Space forces me to dole out praise sparingly, but Victoria Buchtan, as Eponine, gives a characterization as fresh and warm as this morning's croissant. Some will argue that bearish Brady Patsy's hold on "Stars" is mightier than all else. Maybe. But Peter Matthew Smith's Valjean is a portrayal that deserves time on Broadway; vocally and dramatically, he underscores the power and importance of individual responsibility. I refuse to believe that Donovan Smith, as Enjorias, is a 21-year-old student at Carnegie Mellon – he owns not a voice but a powerhouse that will make him a legendary opera singer. And Tim Hartman as Master Thenardier? I'm starting to fall in love with his acting and antics ... could anyone adjusting his privates make me laugh harder? Kim Brown's stunning costumes have been plucked from either Spotlight Costume archives or lifted from historical archival pages and recreated. Brava! 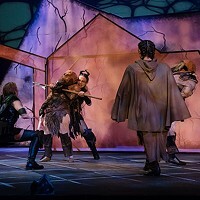 The fight choreography by Shaun J. Rolly might require a cast count after each performance. The shootings and stabbings are as real-looking as the blood. C'est merveilleux!